Blowout Sale! Free Shipping Included! 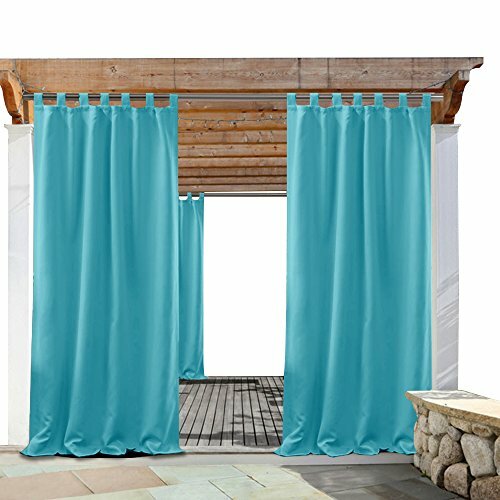 Save 51% on the PONY DANCE Outdoor Curtains Waterproof - 95'' Long Tab Top Solid Wind Keep Out Thermal Insulated Light Block Curtain Panels Patio, 52 x 95 inch, Turquoise, 1 Piece by PONY DANCE at Lawn and Garden Mart. MPN: PDUSBLKOTRP1-5295C07. Hurry! Limited time offer. Offer valid only while supplies last. PONY DANCE Outdoor Blackout CurtainPONY DANCE Outdoor Blackout Curtain helps you to enjoy the carefree and relax outdoor moment as much as you could. PONY DANCE Outdoor Blackout Curtain helps you to enjoy the carefree and relax outdoor moment as much as you could. It can protect you from harsh sunlight, UV Ray, strong wind and mildew. 1. The 7 tab top (3" Long) fit to most standard curtain rods. 2. Made of triple woven micro-fabric, PONY DANCE Outdoor Curtains feels soft, heavy-duty, color-resistant and waterproof. 1.Protect you from 85%-99% harsh sunlight, UV ray and strong wind outside. In addition, it is anti-bacterial and mildew repellent. Good for your and your family health. 2. Can be used to create a private space for you outside if necessary, protecting your indoor / outdoor privacy. 1. Each outdoor blackout panel measures 52"wide. Available in 84", 95" and 108" lengths. 2. 7 colors available: Grey, Beige, Brown, White, Taupe, Teal Blue, Grass Green. READY MADE - 1 curtain measuring 52" W by 95" L include. 7 tab top (3" Long) fit to most standard curtain rods. Check your frame dimensions for proper fit before choose the size. DURABLE MATERIAL - The outdoor curtains drapes made of fade & mildew resistant waterproof fabric, 100% polyester, specific for using in the outdoors indoors conditions.